Go paperless with our school inspection form! 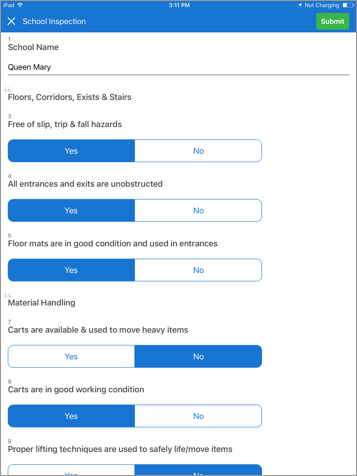 QuickTapSurvey can make your next school inspection survey easier and faster using our offline survey app. Use a school inspection template to help you gather consistent, scalable data that can be stored in the cloud for easy analysis. Multiple schools can upload their inspection survey data simultaneously. There is no need to send people out with a clipboard to inspect schools, then type that information into a seperate form online. With QuickTapSurvey’s offline app, you can sync all inspection data from all schools. If do not have access to the school’s Wi-Fi, that is not a problem. QuickTapSurvey will allow you to collect school inspection data without internet access. The school inspection information collected can be synced to your account once you have an internet signal. With all the data collected from your schools syncing to the same account location, you can break down school performance by year, location, semesters, and more. When interviewing multiple people, it is important to have consistent survey questions. Teachers, students, administrators, custodians, and others need to answer a standardized form in order for your school inspection data to be accurate and actionable. With scalable, predictable data, you can present to others in a more efficient manner. QuickTapSurvey can easily export inspection data from your school to other formats, and you can even work with our many integrations to display the inspection data you gathered. Make school inspection presentations a breeze by importing your completed questionnaires directly to PowerPoint, Google Slides, or the display program of your choice.